- Using Sequential : different predefined layers are stacked in a stack. - Using Functional API to build complex models. A Dense model is a fully connected neural network layer. It is a way to accelerate learning and generally achieve better accuracy. 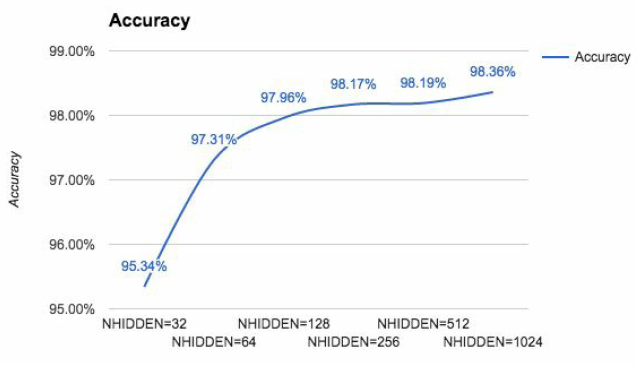 - Accuracy : is for classification problems. - Error loss : the difference between the values predicted and the values actually observed. A metric is a function that is used to judge the performance of your model. 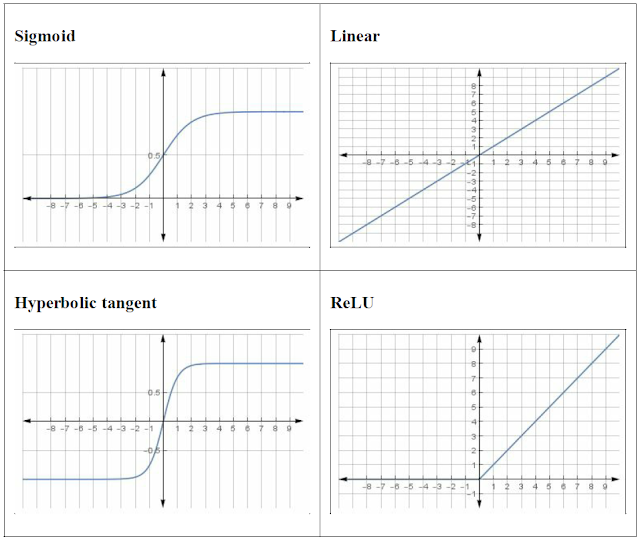 It is similar to an objective function but the results from evaluating a metric are not used when training the model. Optimizers are SGD, RMSprop, and Adam. - Check pointing saves a snapshot of the application's state at regular intervals, so the application can be restarted/recovered from the last saved state in case of failure. The state of a deep learning model is the weights of the model at that time. Using ModelCheckpoint(). Set save_best_only to true only saving a checkpoint if the current metric is better than the previously saved checkpoint. - Using Quiver and Keras : a tool for visualizing ConvNets features in an interactive way. We reserve apart of the training data (test set) for measuring the performance on the validation while training. Use MNIST images, each image is a 28x28 pixels. So create a neural network with 28x28 neurons, one neuron for one pixel. Each pixel has intensity 255, so we divide it with 255 to normalize in the range [0, 1]. The final layer only has a neuron with activation function softmax. It "squashes" a K-dimensional vector of arbitrary real values to a K-dimensional vector of real values, where each entry is in the range (0, 1). In this example, the output value is in [0-9] so K = 10. In recognizing handwritten digits, the output value is in [0-9] can be encoded into a binary vector with 10 positions, which always has 0 value, except the d-th position where a 1 is present. - optimizer : the specific algorithm used to update weights when training our model. - objective function - loss function - cost function : used by the optimizer to map an event or values of one or more variables onto a real number intuitively representing some "cost" associated with the event. In this case it is to be minimized. - epoches: number of times the optimizer tries to adjust the weights so that the objective function is minimized. - batch_size : number of samples that the optimizer performs a weight update. - validation_split : reserve a part of the training set for validation. Note: On Linux, we can use the command "nvidia-smi" to show GPU memory used so that you can increase batch size if not fully utilized. - Checking convergence and over fitting when training. 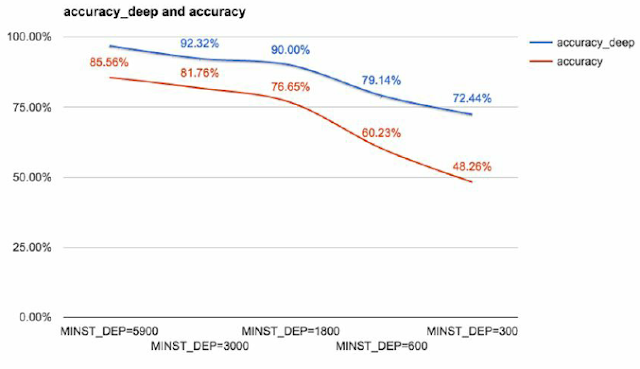 + accuracy on the training and validation datasets over training epochs. + loss on the training and validation datasets over training epochs. Note: For every experiments we have to plot the charts to compare the effect. - Add additional layers (hidden layers) to our network. After the first hidden layer, we add second hidden layer, again with the N_HIDDEN neurons and an activation function RELU. - Using Dropout. This is a form of regularization. 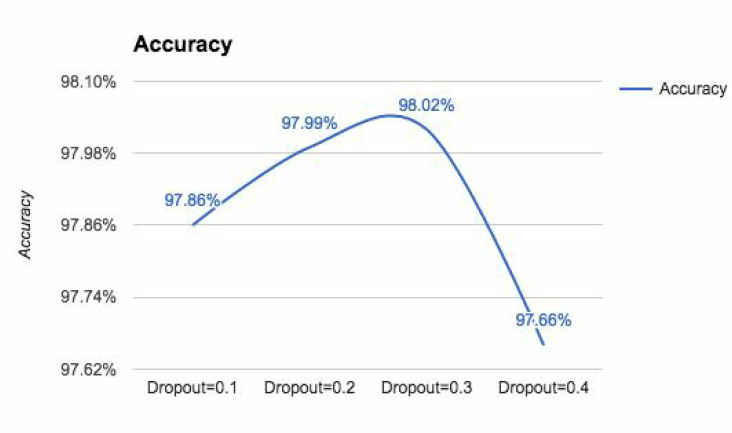 It randomly drop with the dropout probability some of the neurons of hidden layers. In testing phase, there is no dropout, so we are now using all our highly tuned neurons. - Testing different optimizers. Keras supports stochastic gradient descent (SGD) and optimization algorithms RMSprop and Adam. RMSprop and Adam used the concept of momentum in addition to SGD. These combinations improve the accuracy and training speed. - Adjusting the optimizer learning rate. This can help. - Increasing the number of internal hidden neurons. The complexity of the model increases, one epoch time increases because there are more parameters to optimize. The accuracy may increase. - Increasing the training batch size. 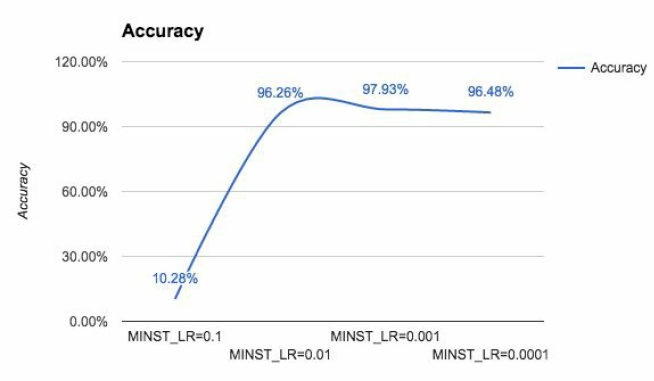 Look the accuracy chart to choose the optimal batch size. Learning is more about generalization than memorization. 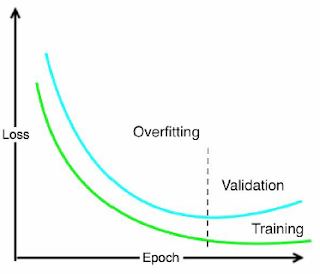 Loss function decreasing on both validation and training sets. However, a certain point the loss on validation starts to increase. This is over-fitting and we have a problem with model complexity. The complexity of a model can be measured by the number of nonzero weights. If we have 2 models M1 and M2, with the same result of loss function over training epochs, then we should choose the simplest model that has the minimum complexity. In order to avoid over-fitting we use regularization. Keras supports both L1 (lasso, use absolute values), L2 (ridge, use square values), and elastic net (combine L1+L2) regularizations. + Grid search: build a model for each possible combination of all of the hyperparameter values provided. + Random search : build a statistical distribution for each hyperparameter then values may be chosen randomly. We use this in case hyperparameters have different impact. + Bayesian optimization : the next hyperparameters are a improvement that based on the of training result of previous hyperparameters. General deep network do not care about the spatial structure and relations of each image. 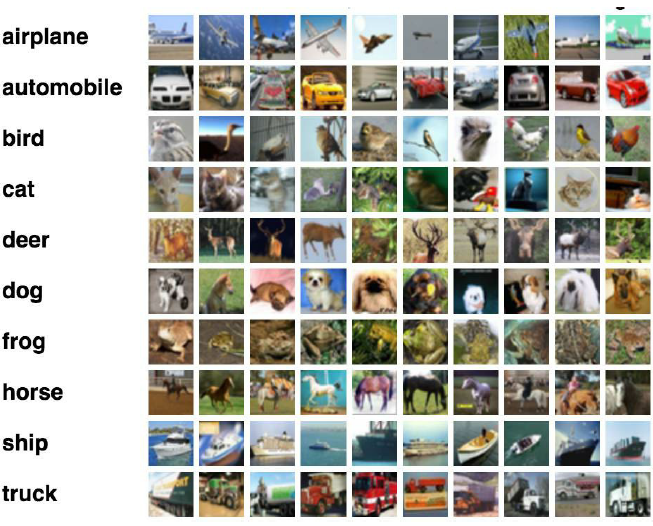 But convolutional neural networks (ConvNet) cares about the spatial information so it improves image classification. CNN uses convolution and pooling to do that. 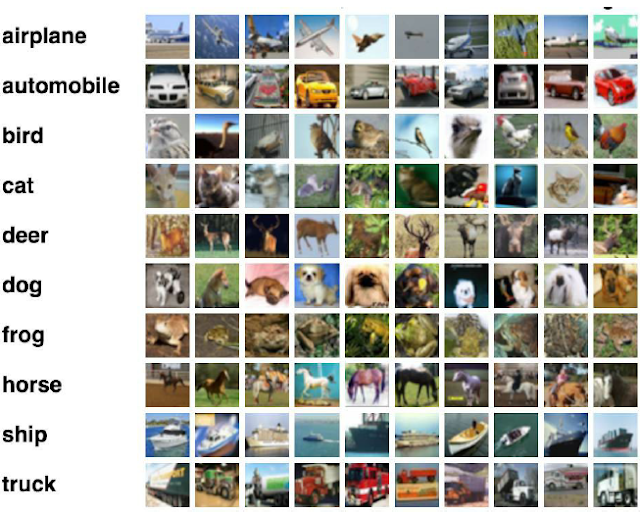 A ConvNet has multiple filters stacked together which learn to recognize specific visual features independently in the image. Applying a 3 x 3 convolution on a 256 x 256 image with three input channels and 32 filters, and max polling. Using MINST data, we test these 2 networks by reducing training set size with 5,900; 3,000; 1,800; 600 and 300. Test set size still be 10,000 examples. All the experiments are run for four training iterations. The CIFAR-10 dataset contains 60,000 color images of 32 x 32 pixels in 3 channels divided into 10 classes. Each class contains 6,000 images. The training set size is 50,000 images, while the test sets size is 10,000 images. The goal is to recognize unseen images and assign them to one of the 10 classes. Each layer learns to identify the features of input that are necessary for the final classification. Higher layers compose lower layers features to form shapes or objects. Reuse pre-trained CNNs to generate new CNN where the data set may not be large enough to train entire CNN from scratch.